It’s always donut weather to me, but at the moment it’s REALLY donut weather. It’s time to go to the cider mill and get a half dozen donuts for yourself. 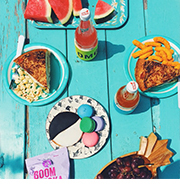 It’s time to chug cider until your tum is an ocean. It’s time to wander on nature trails to nowhere. It’s time to put salted caramel on and in everything. It’s donut o’clock. 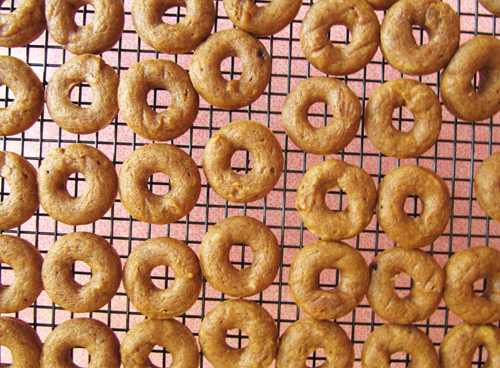 Can you believe this recipe makes either 6 big donuts or like 57 minis?! Whoa. It makes me think that I should eat 10… Donut math. Justification multiplication. Feel free to leave these plain and dunk them in icing and caramel. Feel free to embrace donuts right now. Hug them while wearing them as a pinkie rings. Let’s do this. Please note: I used a mini donut pan for these, but you can always make these in a mini muffin pan. Simply bake a bit longer, until a toothpick inserted in the center comes out clean. Preheat your oven to 325F. Spray your donut pan with cooking spray. In a large bowl whisk together the flour, baking soda, spices, and salt. In a medium bowl whisk together pumpkin, sugar, egg, oil, and vanilla. Add wet ingredients to dry and stir until blended and smooth. Transfer batter to a sandwich bag (It won’t all fit at once.) Snip the corner and pipe the batter into each donut cup about 1/2 full. Bake for 6 minutes or until donuts spring back when lightly pressed. Transfer donuts to wire rack to cool. Make glaze by melting butter in a small sauce pan over medium heat until 4-5 minutes, or until browned. Pour over confectioners’ sugar in a small bowl. Stir in vanilla and milk until smooth and glazey. I had to add milk a couple times while glazing since it firmed up a bit. Dip cooled donuts in glaze. 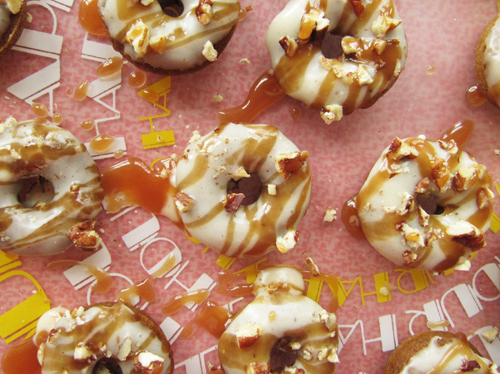 Sprinkle with pecans and drizzle with caramel. 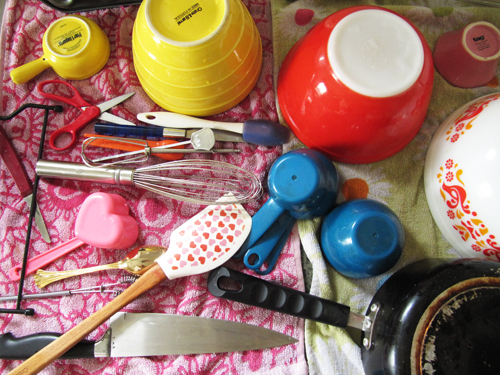 I’m not into doing dishes, but I can’t be mad at these guys. I need these in my life. Or more specifically, in my face. You’d probably want to marry them! Donut math. Gah. I love it. 57 minis?????!!!!!! WTF!!!!!!! (love the addition of the caramel sauce) holy sheet, girl! Right?! Redonk! But totes a donut miracle! donut jewels are just the classiest. get yo’ caramel donut on, girrrrl! 57 minis AKA 1 serving for my face. I want to do that thing from the intro of Amelie, where she sticks a raspberry on each finger and then carefully eats each one, with these. Ah! Yes! These would be perfect for that. Girl, you are OUT OF CONTROL with these! Utterly, magically divine. Holy moley. I can’t wait to give them a try! Love the addition of the salted caramel glaze. It’s like a fall explosion up in here! Justification multiplication. I like it. These look amazing. There are so many good things happening here! I want to walk a nature trail with a mini donut for a pinkie ring! That drizzle action up there is making me crazy in the best way ever. I’m about to embark on the pumpkin muffin train tomorrow. You’ve got me inspired. Great post. hey! always loved the idea of pumpkin baked into stuff but recently, i bought a can of libbys pumpkin puree and tried it for the first time. it had a really straaaaange smell that i can’t get used to. any comments? 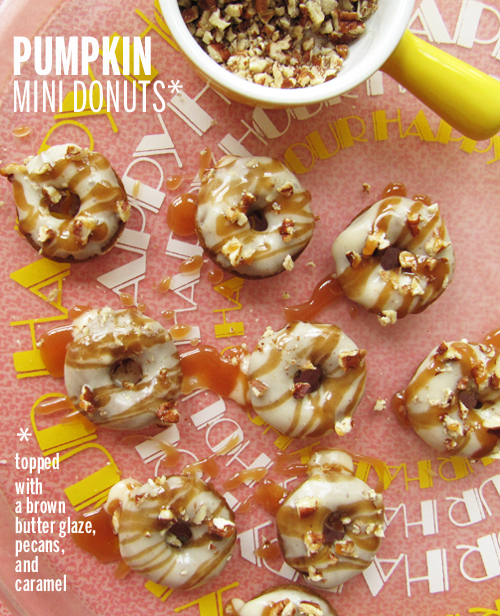 I just made these mini donuts….what a perfect recipe for fall. 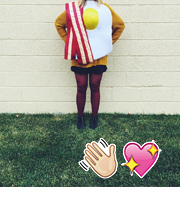 Your blog is inspiring and everything I have made is delicious. You rock!